More than 500 admitted students will fill the Dome on Sunday, April 14, for Own the Dome. The overnight event gives admitted students an out-of-the-box opportunity to be acquainted with one another and with current students, faculty and staff. Rows of sleeping areas line the Dome turf, inviting admitted students to get some rest the night before an Admissions spring reception. The other three-quarters of the Dome turf is filled with events, activities and games all night. Even though the lights are dimmed from 12:30 to 6:44 a.m., the energy of the night never fades. Admitted students are welcomed to the turf for a picnic, with the biggest event of the night right around the corner: the most intense game of rock, paper, scissors to ever be played. Along with Butler, Barrington Bucknor ’21 is emceeing the event. Both University 100 members, Butler and Bucknor are excited to take on this opportunity from two different perspectives: Butler attended Own the Dome as an admitted student and has come back every year since as a volunteer, while this will be Bucknor’s first Own the Dome. Over the years of Butler’s attendance at Own the Dome, some things have changed, but the opportunity to connect with new Orange friends has remained. Last year, ThinkFast entertained admitted students for the first time, and they are returning this year. The interactive trivia company’s return, along with the chicken tenders, excite Butler most for the upcoming event. Bucknor is excited to experience the event for the first time alongside the admitted students and the more than 130 current student volunteers that attend. The students involved go through training to facilitate groups of and act as mentors to the admitted students. 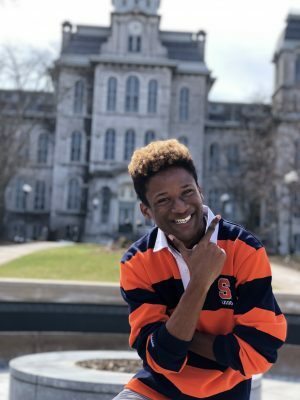 The responsibility to show admitted students what it means to be a Syracuse student is one that excites Bucknor, given his experience as a tour guide on campus. On Sunday, when admitted students flood the Dome and the campus, beyond the student volunteers and dozens of staff on site, the whole campus will open itself to folks from across the world that may make Syracuse University their home for the next couple years. 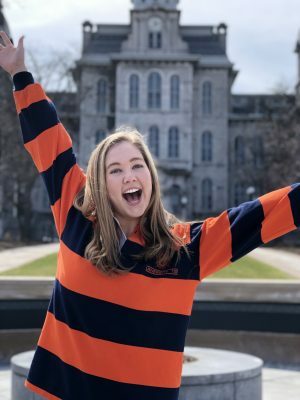 “As a high school senior, I arrived at Own the Dome unsure about where Syracuse stood on my list of future schools and, because of the current students who answered my questions, shared their stories and bled Orange throughout the whole event, I flew home to California knowing Syracuse was the school for me,” says Butler.